Virgil, myself and our team at Kingsway Boxing are so excited to welcome you all back this Fall! 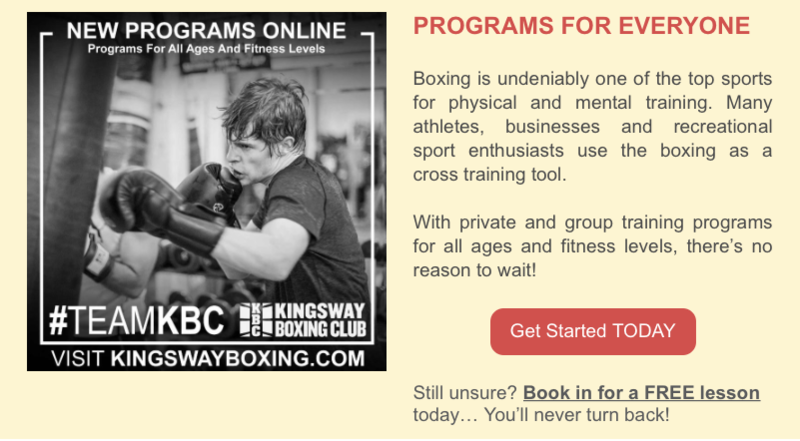 Kingsway Boxing now operates out of two separate locations, which allows for a wide range of people, with varying interests, to accomplish any goal. We successfully run competitive and recreational boxing programs, while hosting a variety of fitness and high performance athletic programs out of both locations. We even offer Sport Specific Registered Massage Therapy and High Performance Yoga! See below for all the new programs available at both locations! In The Meantime, Keep Your Hands Up!